My girl will be 11 years old in November. For the past year she has been getting very angry and trying to bite my husband and I. This behavior does not seem to have one particular thing that brings it on. Sometimes we can just be petting her and she will start growling, barking and try to bite us. This breaks my heart because I do not know what is causing her to be this way. Does anyone have a suggestion as to why my loving dog is suddenly becoming very aggressive towards us? 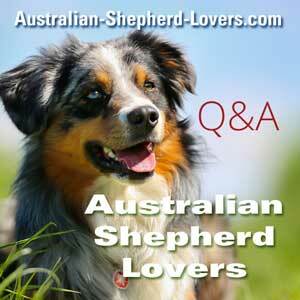 I often hear about younger Australian Shepherds getting aggressive, especially in adolescence. For an older Aussie to suddenly become aggressive it is unusual. The first thing that comes to mind is that she is in pain. For example, arthritis can set in and cause severe pain. You mention that she sometimes starts to growl and become aggressive when she is being petted. It's possible that the petting is causing pain in affected areas. I would be especially concerned that this is the case if she is showing hesitation or avoiding jumping up on things (like getting on the couch or bed) or going up/down stairs. Mental faculties can decline in dogs just as they can in humans. 10 or 11 years old is getting up there for dogs. It's old enough that I would have to recommend having your vet check her out to rule out medical conditions that could be causing this out-of-character behavior. It is very unusual for an adult dog to undergo a personality change for no reason. It sounds like a pain response. Something else that it could be and I hate to scare anyone but would like to help the dog. We had a mixed breed once... same thing when he got older. It was a brain tumor. I hope this is not what your dog has. Please take your Aussie to the vet!